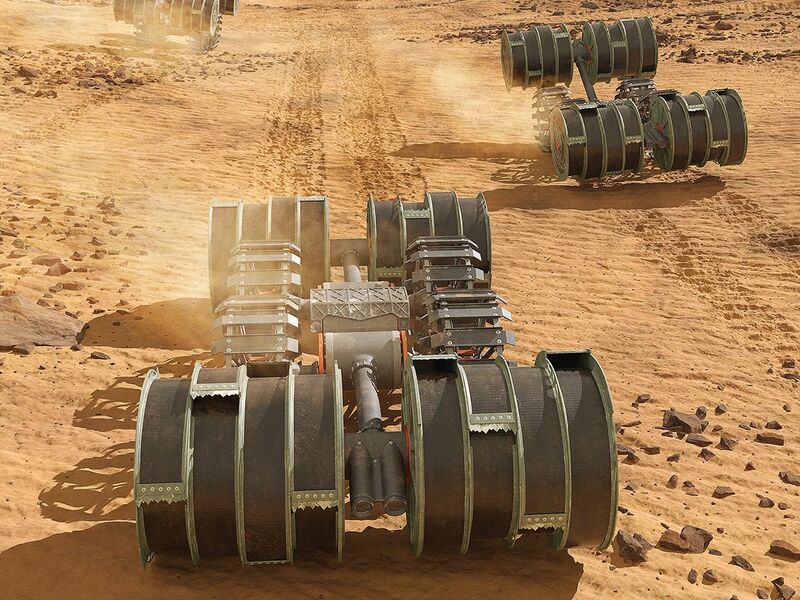 This artist’s rendering shows excavating robots that may one day operate on Mars, long before humans ever set foot on the planet. 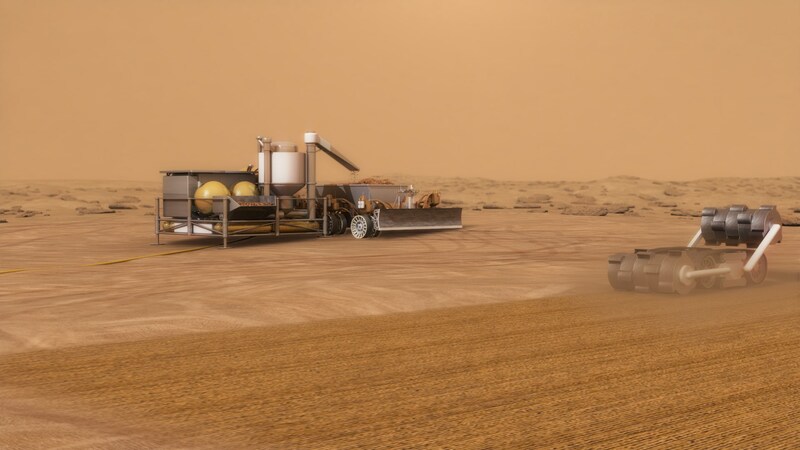 ISRU system concept for autonomous robotic excavation and processing of Mars soil to extract water for use in exploration missions. You’re an astronaut settling into your first mission on Mars, a less-than-hospitable planet to which human beings are ill-adapted. The atmosphere is over 95 percent carbon dioxide (CO2) and the temperature averages a chilly -81 degrees Fahrenheit. Yet, despite this outright hostile environment, you and your crewmates brought relatively few supplies. Bringing enough food for the whole three-year mission was cost prohibitive. Even considering the dramatically lower launch costs offered by private companies like SpaceX, it might still cost $144 million or more to send three year’s worth of food to Mars for a crew of four (assuming SpaceX’s Falcon Heavy can achieve a launch cost of $3,000 per pound and one astronaut consumes one ton of food per terrestrial year). 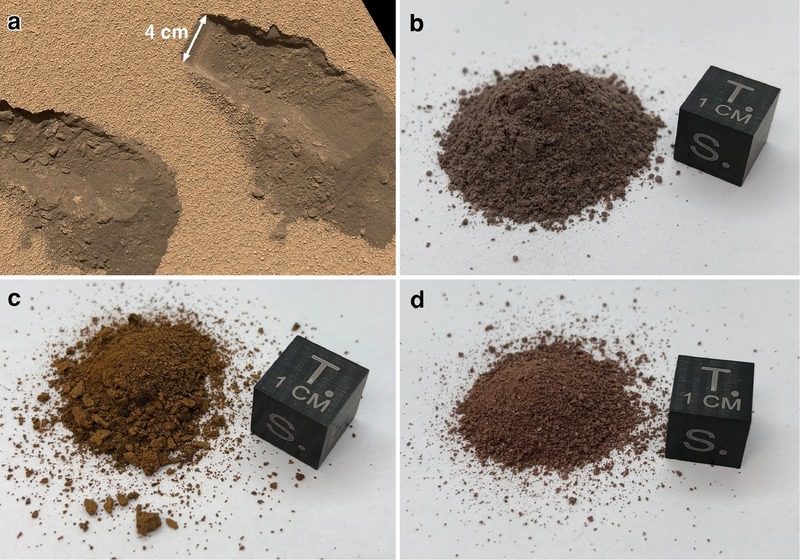 Instead, you’re equipped with a variety of in-situ resource utilization (ISRU) technologies that will allow you to convert compounds into useful materials and advanced recycling systems that will help ensure nothing is wasted. Here on Earth, humans haven’t historically been concerned with waste. The World Bank estimates that the world’s cities will be producing nearly 2.5 billion tons of solid waste annually by 2025. Yet on Mars, where resources are scarce, we’ll be forced to treat seemingly useless materials and byproducts like valuable commodities. Fortunately, NASA has already been perfecting many important recycling and upcycling technologies on the International Space Station (ISS). The objective is to create a closed-loop system in which the outputs of a process can be used as inputs in another process in perpetuity. 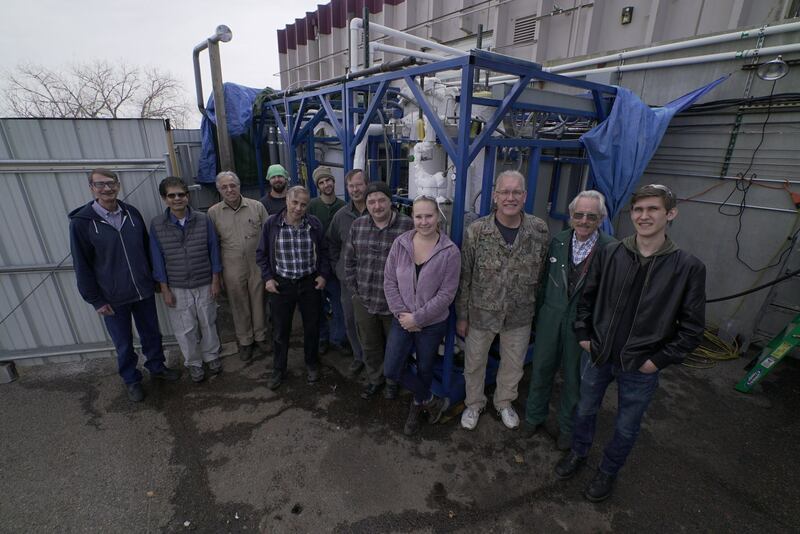 From November 14-15 2017 the R&D team at Pioneer Energy, a spinoff company of Pioneer Astronautics, conducted a 24 hour non-stop demonstration of an integrated Reverse Water Gas Shift-Methanol system. We also did a 5 hour demonstration of a system for turning the methanol into dimethyl ether. All tests were witnessed by judges from the X-Prize Carbon competition. The RWGS was run at an average rate of 70 liters per minute CO2 and hydrogen feed. It averaged about 99% efficiency in reducing CO2 to CO, producing an exhaust that was roughly 99% CO and 1% CO2. Conversions as high as 99.8% were achieved, but system parameters were adjusted to decrease efficiency to 99% because 1% CO2 is desired in the methanol synthesis feed to improve system kinetics. Approximately 81 kg of water was produced by the RWGS in the course of the 24 hour run. It may be noted that if the water produced by the system were electrolyzed, it would produce 72 kg of oxygen per day, or 36 metric tons over a 500 period. The methanol system would produce 52.5 metric tons of methanol. The DME system would produce 28.5 tons of DME. Oxygen burns with DME at a stoichiometric ratio of 2.087. So if the 28.5 tons of DME produced were combined with 59.5 tons of oxygen, a total of 88 tons of useful bipropellant would be available. Alternatively, if oxygen is viewed as the limiting propellant, by combining the 36 tons of oxygen with 20 tons of DME (to run slightly fuel rich) 56 tons of useful bipropellant would be available. If the oxygen product were used in a LOX/RP engine burning at 2.8:1, at total of 49 tons of useful bipropellant would be available. In any case, more propellant would be produced by such a system than that required for the ascent vehicle in the NASA design reference mission. Finally, it may be noted that if the RWGS system were run in parallel in a Sabatier Electrolysis (S/E) system sized to produce 48 kg of CH4 and 96 kg of O2 per day, a total of 24 tons of methane and 84 tons of oxygen would be produced, which is sufficient to fly the Mars Direct mission. ISRU has entered a new world. Above is a photo of the team that did it.